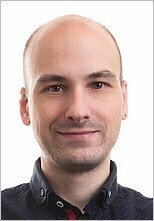 Why Does the "Pattern" in Male Pattern Baldness Develop? 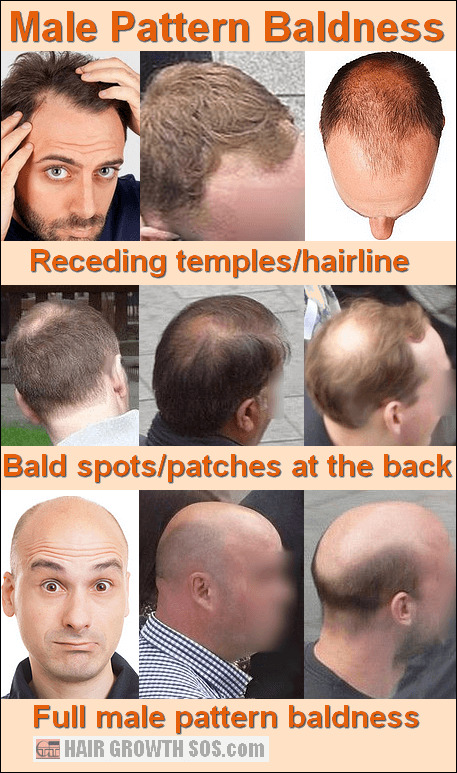 In the photos below, you can see men with the classic male pattern baldness profile at various stages of development. Both men and women suffer this type of hair loss (androgenetic alopecia). But whilst women are affected in the same region of the scalp as men, they normally develop diffuse hair loss (evenly distributed thinning) rather than complete baldness. So why does this type of hair loss always seem to affect the same region of the scalp? The current theory cannot answer that question. Instead, it simply states that hair follicles must be "individually programmed" for hair loss in the male pattern baldness region, but not in any other region. But I’ve already explained that this is not true (you can find out why by reading: male pattern baldness genetics). In the photo below, you can clearly see that the familiar signs of balding have started to develop. And you can also see that the frontal and parietal bones of the skull overlap precisely with the male pattern baldness region. The frontal and parietal bones create the hair loss region of the scalp and, in so doing, provide the boundary between hair loss and hair growth. This is how the familiar male pattern (or horseshoe shape) develops. Notice how hair has receded from the left and right temples but not entirely from the front region - a small patch of hair continues to grow near the original front hairline. I call this "remnant" hair. Also, further back where the frontal and parietal bones meet, you can see more hair trying very hard to keep growing. And, behind that, another significant area of hair loss has developed into a bald patch at the back of the head. So, hair loss seems to have developed from both the front and back of the head independently (i.e., two separate areas of hair loss). The reason for this is because hair loss at the back of the head caused by parietal bone growth, and hair loss at the front of the head is caused by frontal bone growth. If you now take a closer look at these bones, you’ll see exactly how skull expansion causes this pattern of hair loss to emerge. This diagram shows the frontal and parietal bones of the skull. Notice the frontal and parietal eminences. These represent the areas where these bones initially started growing as a fetus in the womb. They then keep growing, pushing against the surrounding bone tissue and increasing their surface area until, eventually, the full adult skull size has been reached. However, the frontal and parietal eminences also represent the location where skull expansion takes place. 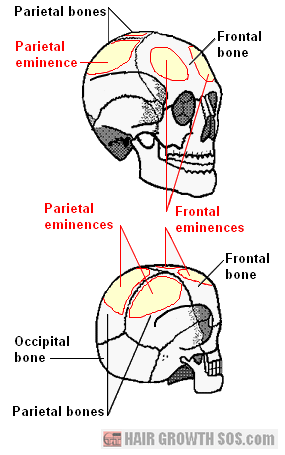 The diagram shows that there are two parietal bones (left and right) each with its own parietal eminence. But there are also two frontal eminences despite there being just one frontal bone. And that’s important because it explains why hair recedes at the temples. Why Do Receding Temples Develop? 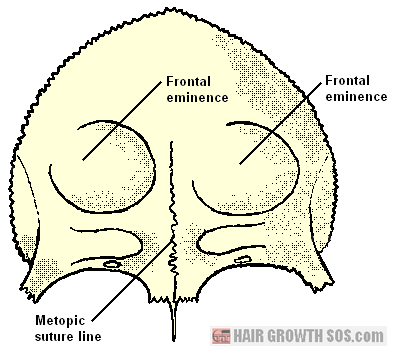 In this image, you can see that the frontal bone has two frontal eminences. That's because it actually starts off in the womb as two bones, not one. As these two bones develop, they gradually fuse together and can sometimes leave a suture line behind, as shown in the picture. The suture line marks the connection between the two frontal bones and usually disappears as a baby grows into a child. However, the two frontal eminences remain. And skull expansion later on in life from both these frontal eminences (left and right) is what causes hair loss at the front hairline to develop. This explains why hair recedes from the left and right temples but not across the entire front hairline in most cases. And it also explains why remnant hair growth often continues at the front between the two frontal eminences. 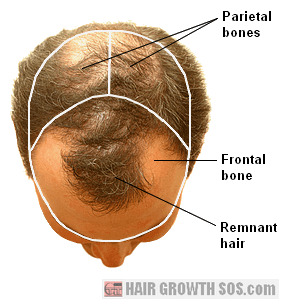 Basically, remnant hair can keep growing wherever there's little or no skull expansion. And that means hair can sometimes keep growing on the top of the head too where the frontal and parietal bones fuse together. You can see examples of remnant hair growth from arrow A in the images below. Why Is There No Hair Loss at the Lower Back and Sides? As you now know, skull expansion and hair loss only develops from the frontal and parietal eminences. And, from the picture on the left above, you can see that these eminences only lie above the temporal ridge, not below. Logically then, it follows that hair loss also only occurs above this line. 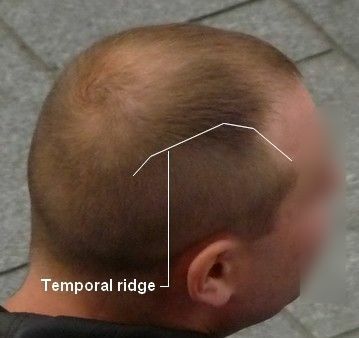 And, as such, the temporal ridge marks an approximate boundary between hair loss and hair growth on the sides of the head. Hair will always continue to grow at the lower back of the head because here, the occipital bone remains largely unaffected by parietal bone growth. So, that’s how the "pattern" in male pattern baldness develops. On the next page, I’ll show you which skull shape characteristics lead to receding temples. This is page 3 of 6. Read next page? Why do receding temples develop in men but NOT women? Read previous page? How skull expansion causes hair loss. 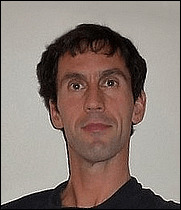 "Dear Paul, I ordered your ebook about 13 months ago, and I just wanted to update you on my progress. So far it has been an absolute success, and I have not lost one hair. I have been vigilant on the routine, and am very happy I stumbled onto your ebook."